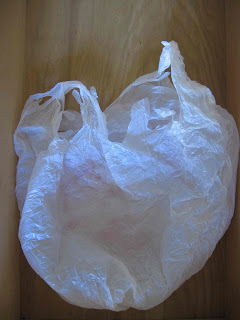 It's So Easy Being Green: San Francisco bans plastic bags!! It's not often that I do a double take while scanning the Yahoo news before logging into my email. But today there was actually some news of consequence. Yesterday, San Francisco passed the long-awaited plastic bag ban. This is a happy day, folks! My only concern is the focus in the articles I've read is being placed on biodegradable bags, which as we know, are NOT the solution. They are resource intensive to make, and what's the point, when we have such a viable solution in reusable bags? Hopefully future coverage will focus more on reusable bags, and in the meantime, it's still as step in the right direction. The Yahoo article is not great...this LA Times story is better.